Authorities in Singapore have seized more than 14 tons of scales of pangolin scales bound for Vietnam in what Paul Thomson of the International Union for Conservation of Nature’s (IUCN) Pangolin Specialist Group described as the largest single such shipment on record, the New York Times reported on Monday. Thomson told the paper that the IUCN estimated around 36,000 pangolins were killed to harvest the scales, which is forbidden by international law. 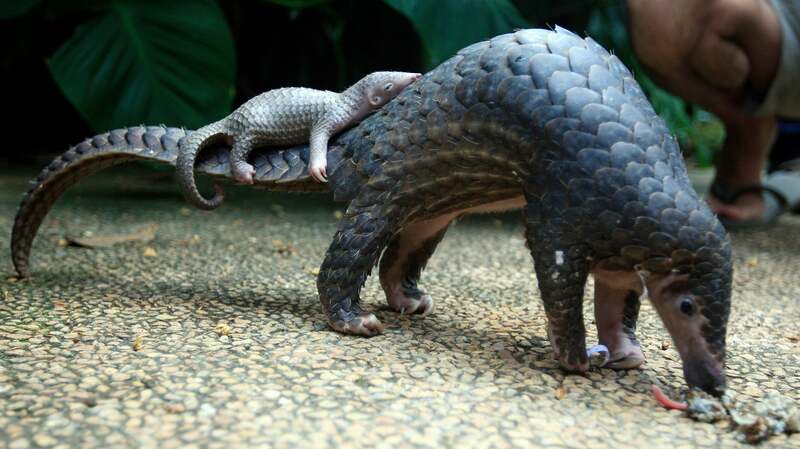 Pangolins are scaly anteaters poached for both their scales, which are sometimes marketed as a (scientifically unsupported) treatment for various health conditions, as well as their meat, which is considered a delicacy in some regions. The pangolin trade was banned by the Convention on International Trade in Endangered Species in 2016, according to the Washington Post. However, domestic trade remains legal in some countries including China, where pangolins are nearly extinct, and Vietnam. Part of the appeal is the pangolin’s renowned ability to stave off predators, with their scaly, keratin-laden hides protecting them even from large carnivores. Unfortunately, pangolins do not fare anywhere near as well against humans, who can easily kill or capture them when they curl into a defensive posture. They do poorly in captivity and usually die within months of capture from a host of health problems. Virtually all trade in them is thus believed to be tied to the black market. By some estimates, pangolins are the most trafficked mammal in the world, far outstripping elephants by raw numbers. Conservation group WildAid told Reuters it estimates 100,000 are poached from the wild each year. It’s not clear from the Times report what species of pangolin fell victim to the poaching operation discovered in Singapore; the IUCN Red List, however, classifies all four Asian species as either endangered or critically endangered, while their four African cousins are classified as vulnerable. All populations are listed as decreasing. Their elusive nature has made it difficult to estimate how many still exist in the wild. However, hunters, traders and locals have reported drastic declines in sightings of Asian species across different parts of their range. Interviews with hunters in 2007 and 2011 suggested populations of the Sunda Pangolin in Peninsular Malaysia have fallen dramatically, with 95 per cent of hunters recognising severe declines, especially since 1990, when the commercial trade began to escalate. The rarity of sightings in the wild, coupled with the massive volume of scales and carcasses seen in trade over the past decade, suggests that all eight species may be on the brink of extinction. In a joint statement, Singaporean customs and parks officials said the shipment (labelled as “frozen beef”) was intercepted during inspection at Pasir Panjang Export Inspection Station. The officials estimated the massive pile pangolin scales as worth approximately $55 million, far outstripping a prior record-breaking bust in China in 2016. Also in the container was around 177kg of carved elephant ivory, which officials estimated to be worth an additional $124,773.